FREDERICK, MD-Mason McCoy ended a wild final two-innings in walk-off fashion, slating home the winning run to give the Frederick Keys (1-3) an 11-10 victory over the Winston-Salem Dash (3-1) on Sunday afternoon at Nymeo Field. Down 10-9 entering the ninth inning with two runners on, Stuart Levy punched a RBI single into right field that tied the game, and McCoy followed with a game-winning hit. The Keys scored eight runs in the bottom of the eighth inning before Luis Robert hit a two-out, go-ahead three-run home run that gave the Dash a 10-9 lead. The final two innings of play saw a combined 14 runs, 13 hits and three lead changes. Trailing 6-1 entering the bottom of the eighth, the Keys scored a pair of runs and loaded the bases for Yeltsin Gudino , who hit a towering grand slam to put Frederick ahead 7-6. The Keys scored two more runs off a throwing error from Will Kincanon to make it 9-6 before Robert played heroics in the top of the ninth. Overall, the eight-run, eighth inning included eight hits between 13 batters and marks the biggest inning for Frederick since opening day in 2017, where the Keys scored nine runs in the sixth inning against the Carolina Mudcats. The Dash opened the game with a 2-0 lead after a Tyler Frost RBI double and run-scoring groundout. They tacked on four more runs in the fourth inning thanks to run-scoring hits from Tate Blackman, Jameson Fisher, and Nick Madrigal to put the Dash ahead 6-0. McCoy made it 6-1 with an RBI single in the fifth inning. He finished the day 3-for-5 with two RBIs. Jomar Reyes was 5-for-5 at the plate with a run, with Levy collected three hits, an RBI, and a run. Keys starter Matthias Dietz did not factor into the decision after throwing three innings and surrendering six earned runs with four walks. David Lebron pitched well in relief, tossing three scoreless innings while striking out seven. Diogenes Almengo (1-0) entered the game in the ninth inning and blew the save but garnered the win. For the Dash, Kincanon (BS, 1) surrendered the grand slam to Gudino, while Kevin Escorcia (0-1, BS) was dealt the loss after allowing two runs in the ninth. The Keys will host the Fayetteville Woodpeckers for a three-game series at Nymeo Field starting Monday at 7 p.m. Right-hander Cody Sedlock (0-0, --) will make his 2019 debut for the Keys and is opposed by right-hander Peter Solomon (0-0. --). Pregame coverage begins at 6:45 p.m. on frederickkeys.com and the TuneIn radio app. 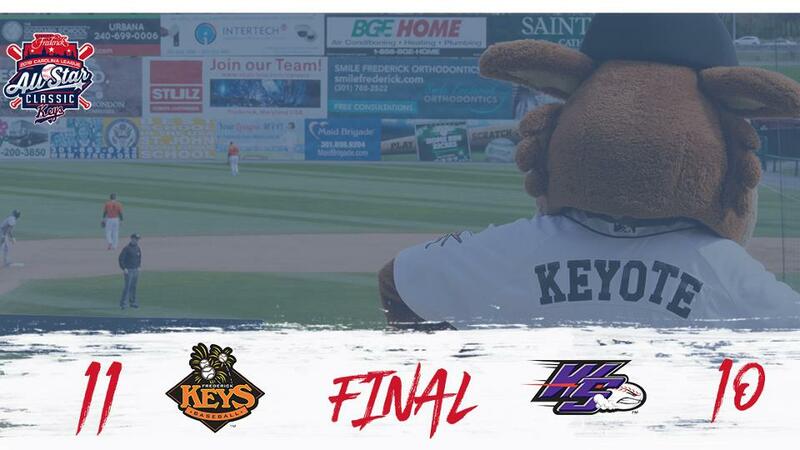 For a complete look at the 2019 Keys promotional schedule fans can visit frederickkeys.com.